Freshly released today, Modern Leisure’s Super Sad Rom-Com is a chilled-out / bummed-out illustration of a songwriter’s studio apartment life. Having departed from former Denver bands The Outfit and Shady Elders, mastermind Casey Banker “wanted to express the loneliness and euphoria of being a guy living in a semi-big city in my 20’s.” Made layer by layer and then re-recorded from scratch, the resulting collection of mid-tempo dream-folk jams make us want to hit the beach and text our ex with a Bluetooth boombox and ice-cold LaCroix in hand. Picked bass guitar digs against a mechanized churn of drums beneath Banker’s breathy croon on “Yr Favorite Self,” a manifestation of said loneliness/euphoria contrast. It might swing like an MGMT track at the hands of a different producer but Jeff Cormack at Staycation Records (and South of France) crafts a charming early Beck feel, supporting Banker’s alluring Foxygen-style lead vocal. 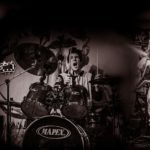 The single “Girls In Black,” is a third wave coffee house hit-to-be, happy alongside Drugdealer or Enon’s more laid-back tunes. Its acoustic guitar instantly makes your head bop. “The Secret Art,” reveals a Nada Surf influence with its sunshine-clean guitar strum while “An Effigy For My Ego” evokes an easier-going, distant, breathy relative of Billy Corgan’s. But Super Sad Rom-Com is not all glazed ennui. 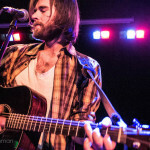 “The Lucky Ones” sneaks an occasional 2-bar measure into its verses, indicating a depth of musicality and “All At Once” lets Banker show off his vocal range, stretching out his melodic, mournful muscle. “You’re born to terrorize – I’m born to romanticize,” Banker sings in the title track – the sunny surface / melancholic undercurrent of which is all part of an admitted dichotomy. “It’s simultaneously low brow and high brow,” he says, which might explain the air of sadness underneath Modern Leisure’s Hawaiian-shirt hypnosis. Born of a tortured artist donning rose-colored glasses, Super Sad Rom-Com makes us wanna tune in and chill out. 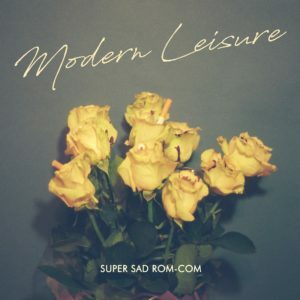 Modern Leisure celebrate the release of Super Sad Rom-Com July 14th at Syntax Physic Opera in Denver.